World War II at a camp in Colorado. 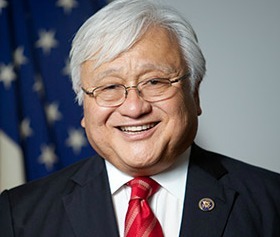 CONGRESS | DISTRICT 17 | It’s well known that Rep. Mike Honda spent a portion of his youth at a Japanese-American internment camp in Colorado. Amid overwrought rhetoric by some conservatives to deny Syrian refugees from entering the U.S. following the Paris attacks last week, Honda penned a forceful response Wednesday. In the opinion piece posted on Medium, Honda said he is outraged by some calling for Syrian refugees to be “rounded up and interned.” Honda’s congressional Twitter feed also fired off a barrage of tweets on the subject late Wednesday afternoon. Glen Casada, a Republican member of the Tennessee state House and Rhode Island State Sen. Elaine Morgan made similar statements this week. “We must now stand up and say ‘no’ to failed leadership and condemn the statements of Mayor Bowers of Roanoke, Tennessee state House GOP Caucus Chair Casada, and Rhode Island State Senator Morgan who would make such ill-advised and backwards-thinking recommendations. They are perpetuating the messages of hate and fear that fly in the fact of what America stands for in the world,” wrote Honda. Instead, Honda, like many Democratic officials, is calling for a thorough screening of Syrian refugees seeking passage to the U.S.
Posted in CA17, congress, internment camp, Mike Honda, refugees, Republicans. Bookmark the permalink. A lot of high ranking Republicans are against admitting Syrian refugees, and who being realistic there is no way to properly screen and vet, and no matter how much such high ranking Democrats as Barack Obama pretend there is. While a lot of high ranking Democrats are in favor of admitting refugees that there is no way to properly screen, on the other hand a lot of Republican are against it. However if in the next several months we have a few Paris type incidents in the United States, then the demagogues, weasels, and members of the Fad of the Month Club that make up a huge portion of the DP will suddenly do a total about face and insist that they are strongly against admitting the refugees. And if you want to see some really high quality entertainment, for the next few years do not spend your time and money going to the circus. Instead, just observe the Democratic Party as it fractures and the various rats start to desert a sinking ship. Since Mike Honda is a member of the Demagogue and Fad of the Month Party – and altho it likes to refer to itself as the Democratic Party – therefore if in the next few months there are a few more Paris and San Bernardino type incidents, and which would cause public opinion to drastically change, AND HARDEN, on such issues as immigration and taking in refugees, therefore, and as Honda saw which way the wind was blowing, in his public positions he would undoubtedly do a total turnabout on the issue of taking in Syrian refugees.